The Alpine brand name remains prestigious in France and most of Europe. It’s little known in America, but there was a time when Alpine competed with Porsche. An Alpine won the Monte Carlo rally leaving all Porsche cars behind in 1971 and 1973, and again at the Le Mans 24 Hours in 1978. Those days were fantastic and Alpine enthusiasts still remember them fondly, but after management errors in the late eighties, production stopped for good in late 1994. Many people have been talking about the brand rebirth since then, this is it. The surprise is that Renault (which bought the Alpine brand in 1973) is not relaunching the brand alone, it teamed with Caterham. The two companies were partners already, as Renault is the engine supplier for the Caterham Formula1 team. Tough this is relatively new, and most people know Caterham as the manufacturer of a modernized version of the Lotus Seven (illustration). But Renault’s partner is Tony Fernandes, owner of the AirAsia airline company, and the F1 team. He bought the Caterham car company only last year, when he needed a new name for its F1 team, after it lost the right to call it Team Lotus. In Tony Fernandes’s hands, Caterham is much more than what it ever was, and it now hopes to launch a brand new, all original model (manufacturing of the Seven shall keep on as it is though). So ultimately, money is the main reason behind the partnership between Renault and Caterham. Renault had said several times that business cases for sports cars like Alpine were difficult. It’s much easier when there’s a partner to share investments with. 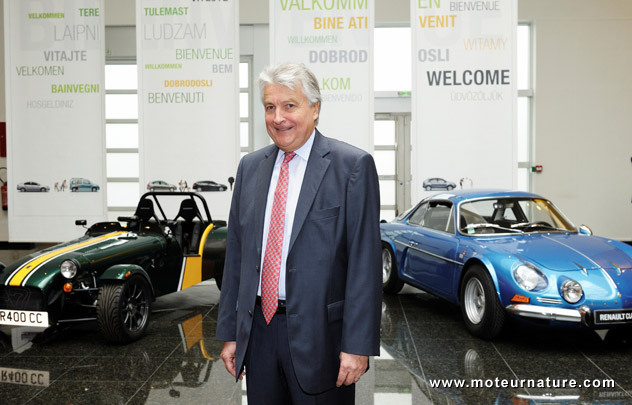 A new company has been created, Société des Automobiles Alpine Caterham (SAAC), with both partners having half of the shares. The factory will remain at the historic site of Dieppe (in Normandy) and two cars will be built out of a single common platform, one carrying the name of Alpine, the other being branded Caterham. The two cars will look totally different though, pretty much like the Chrysler Crossfire was technically a twin to the first generation Mercedes SLK. Next Mazda Miata and Alfa Romeo Spider will also share the same platform and mechanicals, but the upcoming Alpine will be much, much sportier than all those. It will be green also. 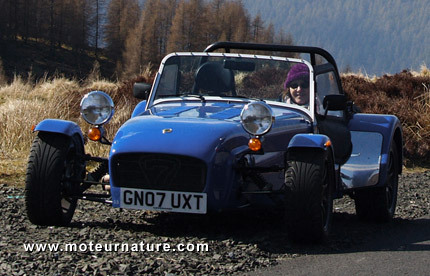 The main asset of all Alpine cars have always been their extreme light weight, exactly like Caterham. Power steering? Not needed! The Alpine A110 (car on the right on our top picture) was less than 1400 lbs. Driven conservatively like few owners ever did, it could get more than 40 mpg. With today’s tech, the new model shall be even better, and Tony Fernandes hinted that price will be at the same level as the actual Caterham Seven. Yet nothing else has been revealed about the cars, only that they should be in showrooms by 2017. Bernard Ollivier (top picture) is the head of SAAC, Alpine’s fate is in his hands. Renault built a concept to mark the 50th anniversary of the A110 earlier this year, watch it against an original A110. But nobody knows yet if the production model will look anything like this A110-50 concept.